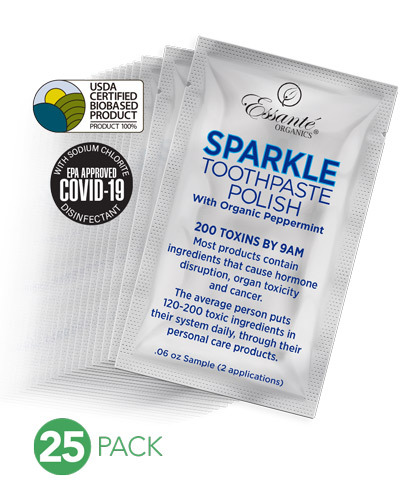 Essanté Organics - 25 Sparkle Packets .06oz ea. Pass to & ask everytone: "Do you brush your teeth? Enjoy & I'll call you tomorrow." No Saccharine, No Fluoride, No Silica, No Triclosan, No Sodium Lauryl Sulfate (Sulfates, SLS, SLES), No Titanium Dioxide, No Carcinogens, No Neurotoxins, No Hormone Disruptors, No dangerous, harmful or chemical ingredients and No Worries. 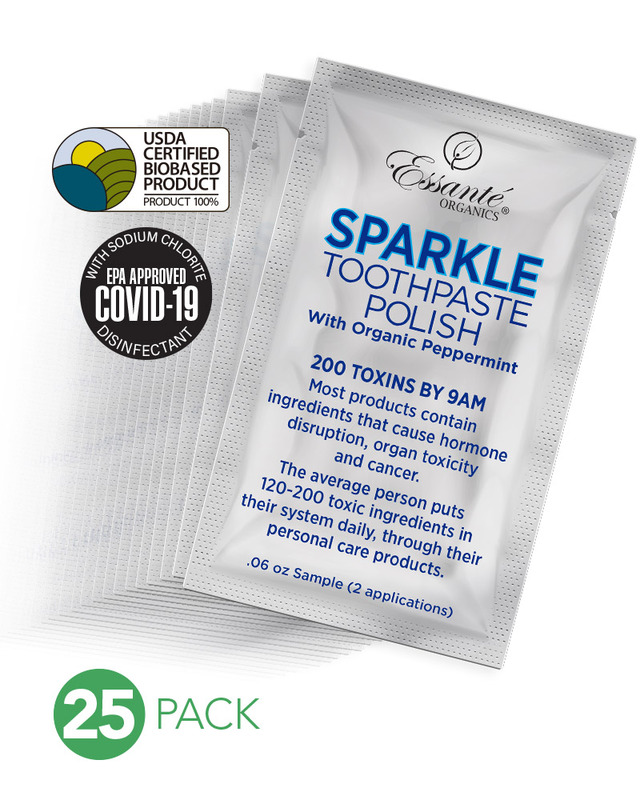 Like all Essante Organics products Sparkle Toothpaste Polish is guaranteed to be the best tasting, best working, best whitening, most addictive toothpaste you have ever enjoyed, or send it back for an exchange or refund. 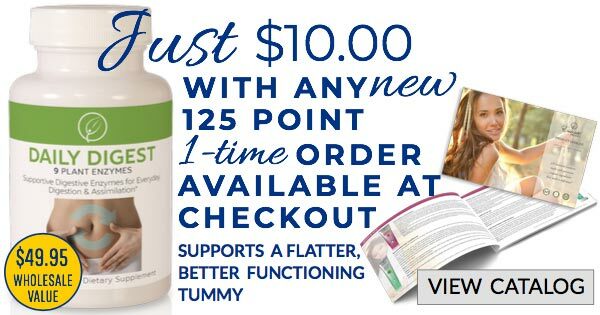 See details below including testimonials, 30 Day Satisfaction Guarantee, Bacterial Efficacy Sheet, and Guarantee & Green Seals. Glycerine (Vegetable Derived)**, Purified Water, Sodium Chlorite (Stabilized Oxygen), Calcium Carbonate (Mineral), Sorbitol (Glucose), Mentha Piperita (Peppermint) Oil*, Xylitol (Plant Derived), Xanthan Gum (Plant Derived Thickener)**, Stevia*, Decyl Glucoside (Coconut Derived Cleanser), Plant Extracts and Malic Acid (Vitamin E, Bio-flavonoids & Polyphenols derived from fruit). Organic Vegetable Glycerine / Glycerin / Glycerol (all 3 scientific terms are interchangeable and refer to the same ingredient) is a certified ToxicFree® humectant that keeps toothpaste polish moist, and adds a pleasant sweet flavor. Essanté Organics obtains all glycerine from non-GMO vegetable sources, versus the more common sourcing practice from animal by-products.  Clinical studies show vegetable glycerine is soluble in water and does not cause demineralization of the teeth as bleaching agents do (demineralization occurs when the pH balance of plaque is lowered). Glycerine is not acidic it is base, and an excellent ingredient choice clinically proven to help improve overly sensitive teeth. Sodium Chlorite (Stabilized Oxygen) is Mother Nature’s and scientist's top choice as the safest, most powerful, number one antimicrobial on earth. See Essanté Organics Stabilized Oxygen Antimicrobial Efficacy Sheet for a list of all the bacteria, fungi, and viruses it kills including Strep, Staph, Salmonella, Hep C, HIV, E Coli, Candida, Herpes and more. Essanté Organics' Sodium Chlorite is certified ToxicFree®, FDA approved, and it breaks down into salt. Calcium Carbonate is a certified ToxicFree® mineral that delivers strong cleaning power to help remove stains and plaque, as well as polish teeth. Calcium carbonate provides enough abrasion to remove plaque and stains, yet protects and keeps tooth enamel in tact. Note: minerals cannot be classified as organic. Sorbitol is a certified ToxicFree®, non-GMO, slow-metabolizing glucose derived from fruit or seaweed. It adds a healthy sweetness and sustains a good pH balance in the mouth. It does not lower the pH of plaque like sugar, which causes the demineralization of tooth enamel. Organic Peppermint Oil Essanté Organics begins with fresh, organic mint leaves and applies a proprietary triple distillation process. This extra step yields a very smooth, refreshing, sweet taste, especially compared with most toothpastes which use chemical flavorings or peppermint leaves sprayed with toxic pesticides. Essanté Organics' organic peppermint is scientifically proven to support: cleansing, detoxing, swelling, and digestion. 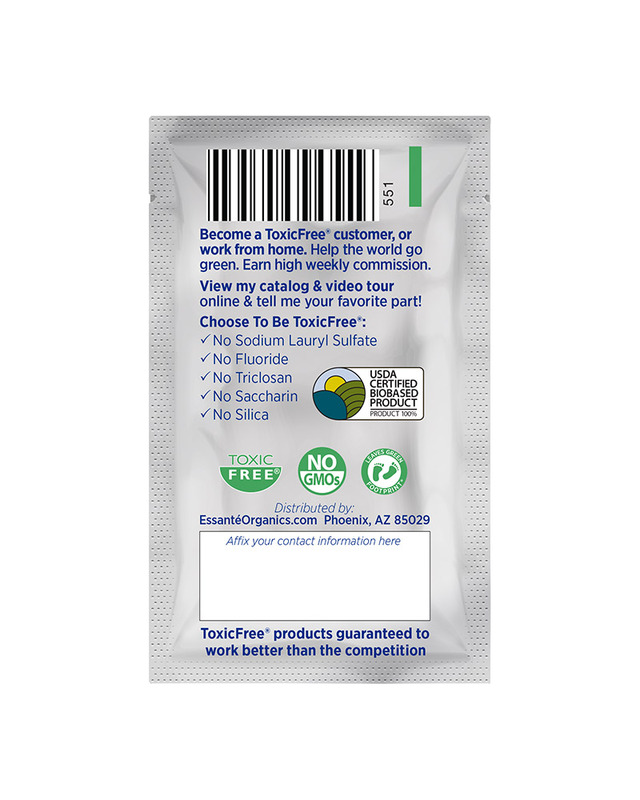 Xylitol is a certified ToxicFree® natural sugar found in plums, strawberries, raspberries, and birch trees. Essanté Organics sources Xylitol is from non-GMO birch trees. Xylitol replaces synthetic saccharine that can cause health issues. Xylitol also replaces sugars that can lead to tooth decay. Xylitol helps prevent cavities by inhibiting the growth of bacteria, including Streptococcus. Organic Xanthan Gum is a natural gum plant thickener that thickens Essanté Organics toothpaste and helps keep Sparkle Toothpaste Polish moist for a 2-year shelf life. Organic Stevia is an unrefined powder Essanté Organics derives from dried, organic, green stevia leaves. It is an extremely useful herb in oral hygiene formulations. Essanté Organics uses grade A organic stevia, due to its highly effective antibacterial and anti-fungal properties and because it does not have an aftertaste as lower grade stevia does. Research shows organic stevia can stopdental decay and bleeding gums when used for an extended period of time, primarily due to its capability to kill bacteria that cause tooth decay and gum diseases. Tooth decay and gum diseases are the two most common problems faced by diabetics. The organic stevia in Sparkle Toothpaste Polish supports blood sugar levels. It provides a zero-calorie sweetness too. Medidart® shares organic stevia’s vast health benefits including its ability to support: blood sugar, weight management, blood pressure, oral health, bone health, skin health and more. These benefits go a long way in motivating some of us to brush with Essanté Organics Sparkle Toothpaste Polish more than the average 2 times per day. In addition, Essanté Organics selects and uses the finest quality organic stevia on earth. Decyl Glucoside is a pure, certified ToxicFree® coconut derived glucose cleanser that creates a foam which traps Essanté Organics Sparkle Toothpaste Polish onto the gums and teeth long enough to provide powerful antimicrobial, anti-fungal, antibacterial, and anti-inflammatory actions.